Spring is the ideal time to make boneless leg of lamb recipes. Lamb roasts provide the perfect centerpiece to a meal, and work equally well for both weekday dinners and special meals for guests. Most of the gaminess exists in the fat. Trim visible fat before cooking. You can balance the gamey flavors in lamb by using vinegar or pungent herbs, such as marjoram, rosemary, thyme, mint and garlic. Overcooked lamb dries out quickly and becomes tough and stringy. Cook lamb to medium rare, which is an internal temperature of about 140 to 150 degrees Fahrenheit. Allow lamb to stand for about 20 minutes after cooking and before carving to allow juices to reabsorb into the meat. Butchers usually partially butterfly a leg of lamb to remove the bone from the meat. If you purchase a bone-in leg of lamb and wish to make one of these boneless leg of lamb recipes, slice into the meat along the length of the bone, then use a boning knife to work closely around the bone until you can "unroll" the meat from around the bone to remove it. This recipe relies on a fully butterflied leg of lamb. To butterfly, open the lamb up along the axis where the bone was removed and lay it flat. Using a filet knife, start at the center of the piece of lamb and place a horizontal cut in the meat about 1/4 to 1/2 inch from the top. Slice until you reach about an inch from the end of the lamb. Unfold the meat to open it, and repeat the cut on the other side. You can also ask your butcher to butterfly the lamb for you. Place the garlic and shallots in a small ovenproof pan. Drizzle the garlic and shallots with olive oil and sprinkle them with salt. Cover the pan with aluminum foil and cook in the preheated oven for 90 minutes, until soft. Allow the garlic and shallots to cool slightly, then squeeze the garlic out of its peel into the bowl of a food processor fitted with a metal chopping blade. Add the shallots, pour in the oil from the pan and process until smooth, about five seconds. Season the lamb with salt and pepper and sprinkle with rosemary. Spread the garlic and shallot mixture over the butterflied lamb. Roll up the lamb, tie it with butcher's twine and place it in a roasting pan. Roast approximately 1-1/2 hours, until the internal temperature reaches 140 degrees F.
This simple preparation infuses the lamb with the delicious flavor of garlic and herbs. For best results, rub the lamb with the herbs and allow it to sit overnight in the refrigerator before cooking. Season the lamb on all sides with salt and pepper. In a food processor, combine olive oil, herbs and garlic, pulsing six to seven times until it forms a rough paste. Rub the paste all over the lamb, including in the area where the bone was removed. Tie the roast with butcher's twine, wrap it in plastic and allow to sit in refrigerator overnight. 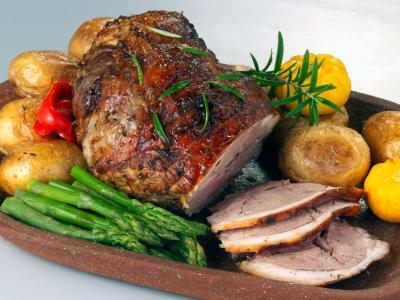 Remove the lamb from refrigerator and allow it to rest 30 minutes before roasting. Roast in the preheated oven until the lamb reaches of an internal temperature of 140 degrees F, about 1-1/2 hours. Allow the lamb to rest for 20 minutes before slicing. Serve these recipes with sides such as new potatoes, risotto or a simple salad. Pair the meal with Pinot Noir. Lamb is eaten far more often in the Middle East than in the West, leading many people to be intimidated by cooking lamb, although they don't have to be. Use the right recipes and learn the appropriate techniques; in no time you can make lamb a regular part of your meal rotation.